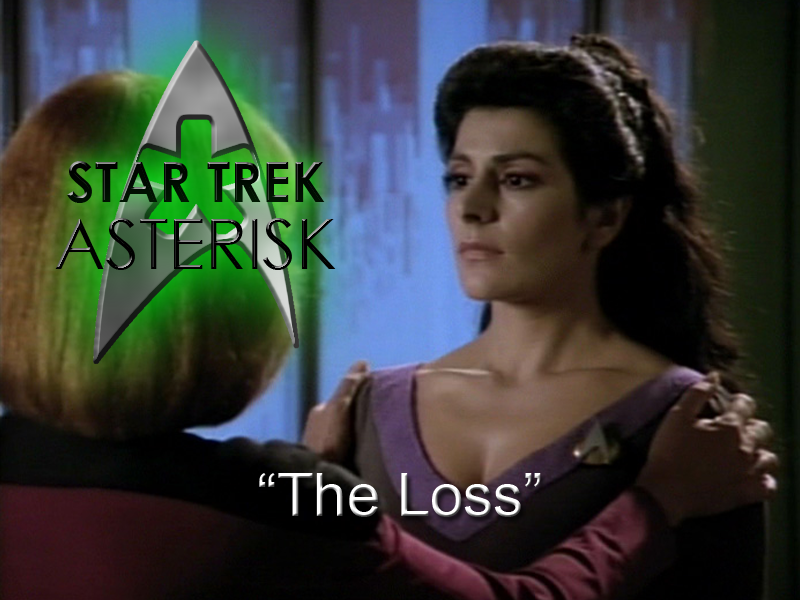 Star Trek: Asterisk "The Loss"
The Enterprise encounters two-dimensional beings and Troi loses all empathy for them. It starts with Troi in a session with Janet. Janet recently lost her husband and she believes she's taking it rather well. She's just been keeping busy and facing death as a natural part of life. But then she breaks down when Troi gives her a memento from her husband and suggests that she's not actually facing it at all. 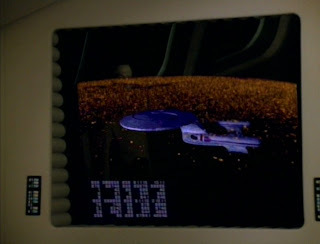 Then the Enterprise senses some kind of "ghost" image in the sensors, so they drop out of warp to investigate. At the same time, Troi gets the worst headache ever. Turns out a lot of people are also getting headaches, so Beverly can't get to her for a while, but as soon as she does, the senior officers are called to the observation lounge. The Enterprise is being held in place by some unknown force. When Picard asks Troi if that force has an intelligence, she reveals that she has lost her empathic powers. This is obviously a devastating thing to happen to a Betazoid. At first, she exhibits a certain denial, thinking that her powers might come back easily, but Beverly tells her to prepare for the fact that they might not come back at all. Beverly wants her to talk to someone else with counseling experience, but Troi insists she can get right back to work. Meanwhile, with the help of Data, Geordi discovers that what's holding them in place is a field of two-dimensional beings. They had trouble sensing them at first because they were so flat. They're floating along like fish in a river and pulling the Enterprise along with them. It should be easy enough to lift out of them, right? Mm... not so much. For now, however, swimming along with the tide is a mere inconvenience. Troi gets back to work and holds another session with Janet who insists she's woken up a new woman. She explains that she cried out her grief for her husband all night last night and is ready to get back to normal. Troi is dubious of this claim. She explains that she lost her empathic abilities, so she might not be of much use, but it seems to her that a single night of crying doesn't make up for such a huge loss. Janet insists Troi is wrong, so Troi goes crying to Beverly. She accuses her of not fixing her in time, and then storms off to Picard's ready room to resign her commission. Picard says empathic ability is not a requirement of her station, but she insists that, for her, it is. Even Riker tries to offer a listening ear to her, but she feels more resentment than relief. Her resentment causes Riker to fire back by calling Betazoids "aristocratic" with their abilities. 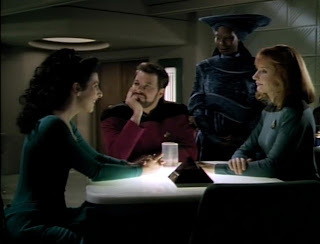 She eventually winds up in 10-Forward where Guinan says she's thinking about taking the counselor position. Troi says it's not as easy as Guinan thinks it is, but Guinan says she thinks she can handle it. Troi gets the idea that Guinan is trying to help her realize that the ship needs her, but she is steadfast. Meanwhile, the two-dimensional beings take a turn for the worst. In fact, they're turning toward a cosmic string which would destroy the Enterprise. 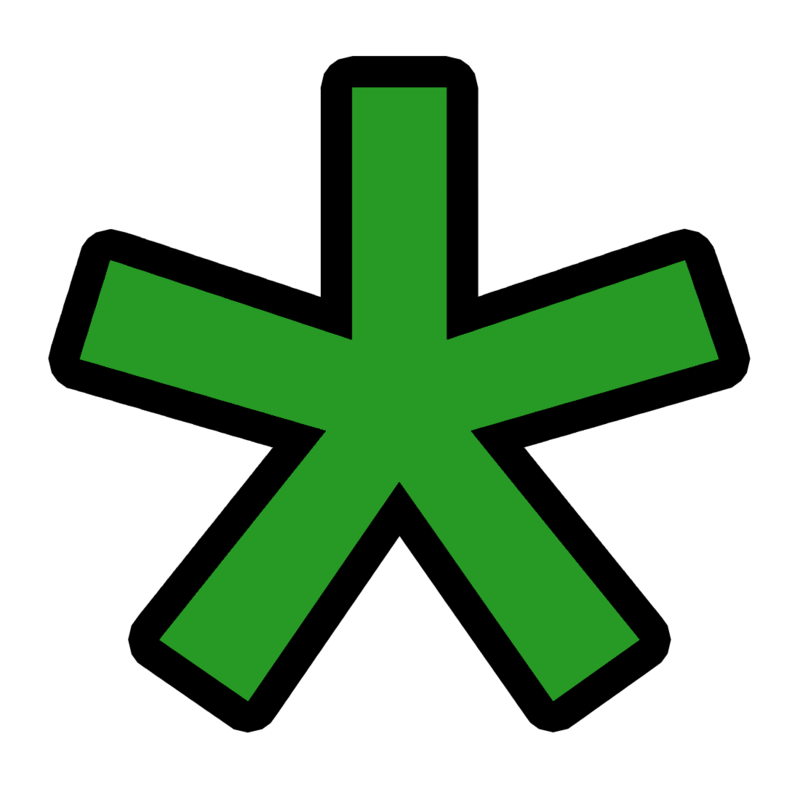 All attempts at communication with the beings has failed, including routing their emissions through the universal translator. So Picard calls upon Troi to help with establishing communication. She's not sure she can do much to help, but she joins Data in the observation lounge as per orders. "Okay, Data, what do you want me to not sense?" 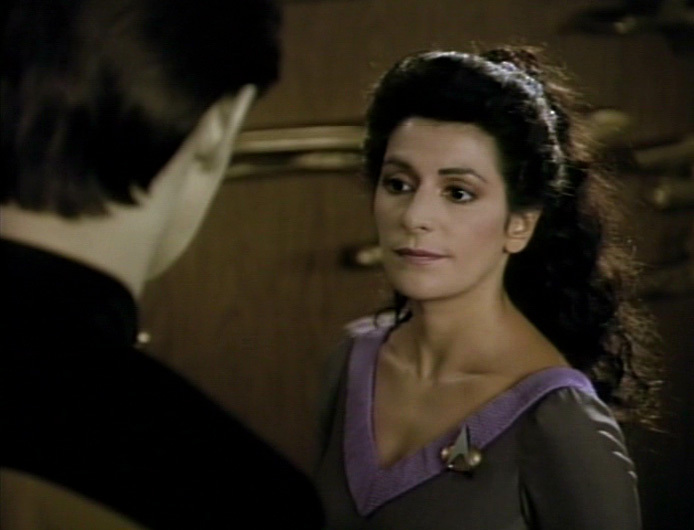 After talking for a while about Troi's disability, and how the counselor position could be handled by drawing on human instinct, Troi starts to wonder if the two dimensional beings are acting on instinct as they move toward the cosmic string. Data thinks it's illogical that they would instinctively head toward destruction, but Troi says it's like a moth moving toward a flame or a horse running into a burning barn. With that in mind, Geordi is able to whip up a setting on the deflector dish to mimic the vibrations of the cosmic string and draw the beings toward the Enterprise. With the force of their movement stopped, the Enterprise will be able to escape. So, they do exactly that, it works, the Enterprise flies away, and Troi finds that her empathic abilities suddenly return when out of the influence of the two dimensional beings. With her empathy returned, she's able to tell the crew that the two dimensional beings are heading home when they move toward the cosmic string. It was never destructive to them at all. Back at 10-Forward, Troi reveals that the high number of two dimensional beings overloaded her empathic circuits, so to speak (don't take that literally, Data). Now that they're out of the field it's fine. Guinan asks if the counselor position is still open and troi says she intends to fill it. Guinan shrugs this off. She just thought she'd ask. 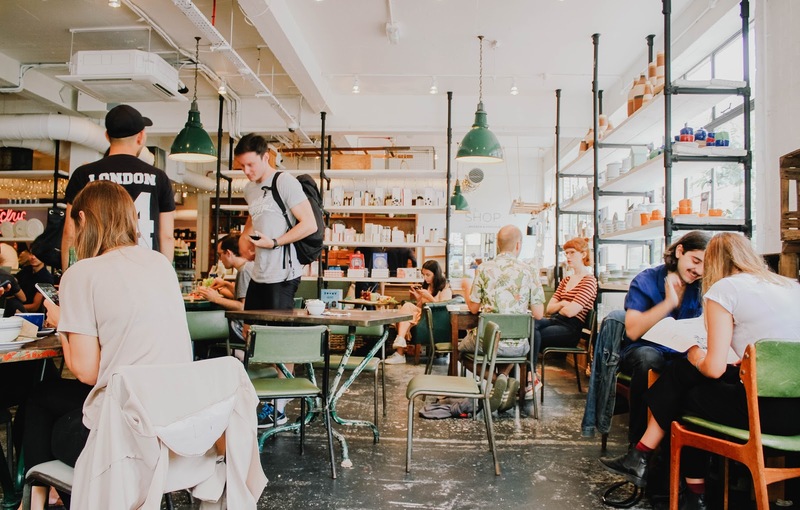 Better hours. And just before the closing credits, Troi warns Riker about ever calling her "aristocratic" again. A lot of this episode didn't really feel right to me. It was quite obviously a commentary on how people deal with being disabled, but Troi seemed to illustrate that commentary a little too quickly. It was only a matter of hours until she became an angst-ridden wreck and threatened to quit her job. It would possibly have been cool if this disability of hers lasted a little more permanently, an idea the writers tossed around for a while, but as it stood it just kinda fell flat. As flat as the two-dimensional beings! That storyline was pretty cool, by the way, and would possibly have been great all on its own.